If he were still alive today, Elvis Presley would have turned 81 years of age on January 8th, 2016. While everyone is familiar with the story of Elvis’ ascent to the King of Rock and Roll, not many are aware that Elvis performed at historic Olympia Theater in downtown Miami. In early August of 1956, The Olympia Theater featured one of the fastest rising talents in music and a legend in the making. A twenty one year old Elvis Presley would not only pack the theater for seven shows in two days, but would create memories that would last a lifetime for those in attendance. Designed by John Eberson to be an “atmospheric theater”, the Olympia Theater was built in 1925 by Paramount. It sits at 174 East Flagler Street in downtown Miami. Eberson was born in a region of Romania and was considered to be the master of “atmospheric theater” design. The intent of the design was to transport the theater attendee to an exotic European courtyard or garden, rather than a box like, formal theater setting. It was a very popular design for theaters in the 1920s. Eberson also designed the Tampa Theater. The Olympia and Tampa are two of the few Eberson designed buildings still standing. The two buildings are the last of the atmospheric theaters remaining in Florida. The Olympia, with ten stories of office space, was considered one of the first air conditioned buildings in the South. It is a brick façade and consisted of a stunning Moorish architecture. From the time of its opening in February of 1926, the public was enamored with this theater. The Olympia featured perfect acoustics and a simulated a night sky, including rolling clouds and twinkling stars. It opened as a venue for silent movies with a seating capacity of about 2000 people. From 1929 to 1954, the theater featured vaudeville live performances. In 1954, it was converted back to a movie theater. 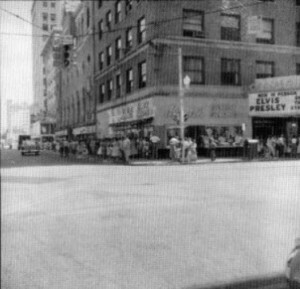 For much of the twentieth century, the Olympia was one of many theaters located on Flagler Street. There were enough theaters on Flagler Street to consider it a theater district. At the time it was announced that the young up and coming singer was going to perform in August of 1956, the Olympia Theater became the center of the world for the teenagers of Miami. By August of 1956, Elvis Presley’s popularity with teenagers and young adults was exploding. On March 2nd, 1956, Colonel Tom Parker had taken over the role of Elvis’ manager. As the spring turned to summer, Elvis had made a number of national television appearances that boosted his popularity and record sales. With the filming of his first movie scheduled for late August of 1956, Elvis’ days touring were going to become scarcer following his shift in career priority. Elvis would become a very popular movie star after the launch of his first film “Love Me Tender”. Colonel Tom Parker scheduled Elvis for a very busy tour of Florida in early August, prior to him leaving the road for the silver screen. Elvis was scheduled to perform in seven Florida cities as part of the August tour. The first stop was Miami where he was scheduled to perform seven shows in two days at the Olympia Theater. Once it was announced that Elvis would be in Miami on August 3rd and 4th, the frenzy and excitement could hardly be contained. 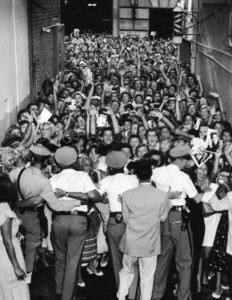 Even prior to Elvis arriving in Miami in his lavender colored Lincoln on Friday, August 3rd, excited fans were beginning to gather outside of the front entrance to the Olympia Theater. According to Dene Petitclerc of the Miami Herald, fans began to line up outside the theater prior to midnight on Thursday, and the line went around the block by noon on the day of the show. As Elvis arrived in Miami, he headed straight for the Robert Clay Hotel to check in. Parker had turned down an invitation to stay at the Fontainebleau Hotel on Miami Beach for fear that fans would destroy the place trying to get at Elvis. The Robert Clay Hotel was located near the Olympia and made sense considering Elvis was performing for multiple shows over two days. After Elvis checked into the hotel, an enterprising Miami Daily News reporter showed up at the Robert Clay Hotel and was able to get an exclusive interview with Presley. Reporter Bella Kelly was able to get the scoop that Elvis never wears “blue suede shoes” because of fear that the shoes would get stomped by adoring fans trying to get to him. Elvis was scheduled to go on stage for the first show by 3:30pm on Friday, August 3rd. At about 4pm, Elvis strolled on stage wearing a lavender jacket, black pants and white shoes. Immediately, the crowd could barely contain themselves. 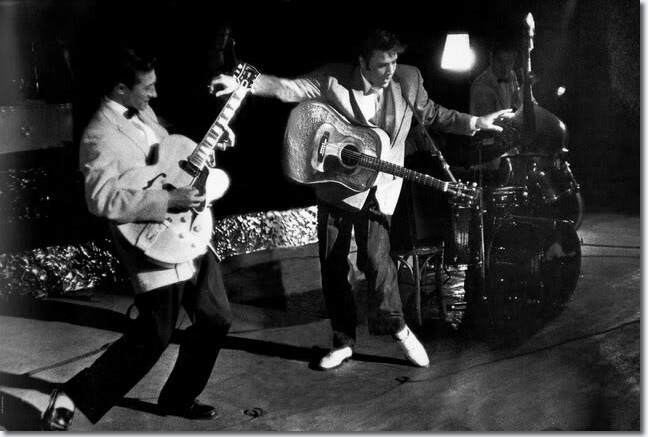 The excitement escalated the first time Elvis went into his patented dance moves. Elvis was protected by a band of Miami Policeman. As they witnessed the crowd’s reaction, one officer shook his head and said he hadn’t anything like this since Sinatra came on the scene. Despite police protection, one fan was able to grab and tear off a part of Elvis’ pink jacket. In addition, another fan was able to grab a part of his black pants. In between shows, Elvis cut up his torn pants and went out to the fire escape to throw clothing fragments to the awaiting fans located on NE Second Avenue. There was plenty of press coverage for the show. The Miami Daily News was represented by Damon Runyon Jr, son of the legendary newspaperman Damon Runyon. He was not an Elvis fan and considered the show, and reaction by the crowd, as “contrived” and “obscene”. Denne Petitclerc documented the show for the Miami Herald. Following the first show, Presley was spotted at the back door of the theater by a mob of 2000 fans that were waiting on NE Second Avenue. It was around 5pm and the crowd blocked rush hour traffic on the busy downtown street. Runyon reported that the mob almost broke a police line to rush the stage door. Runyon’s photographer captured the crowd for the Daily News and it was part of the story the next day. By the end of the last show on Friday, Elvis made his way to his car only to find it covered in love notes and phone numbers written in lipstick. His lavender Lincoln was only a couple of weeks old. The next morning, Elvis went to Miami Lincoln Mercury and traded in his vandalized car for a new Lincoln Continental Mark II. On Saturday, Elvis would conduct four more shows. The last show started at 9pm and Elvis immediately left town at the conclusion of that show. He was due in Tampa the next day to continue his Florida Tour of 1956. There were approximately 15,000 fans that were able to see Elvis perform over the seven shows in two days. One of those fans was a nineteen year old Bob Graham. Graham’s lasting memory of Elvis and the show was the Presley “mystique”. Historian Arva Moore Parks would also share a memory of standing in the zig zag line along NE Second Avenue following the first show and watching grown women walking out with pieces of Elvis’ lavender jacket in their hands. Elvis would cut back on touring and live performances to give priority to making movies and recording. The Florida tour was his last tour before the true beginning of his acting career. Elvis would pass away on August 16th, 1977 at the age of 42. 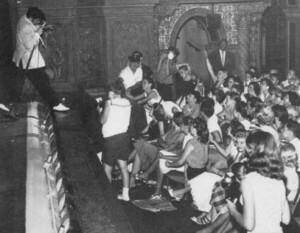 Although the nation will remember Elvis as the King of Rock and Roll, those who attended his shows at the Olympia Theater will always remember the two days Elvis performed in downtown Miami in 1956. 2 Comments on "Elvis Performs at Olympia Theater in 1956"
There was only one show on Saturday. I know because our group of girls were the first in line. We stood there all day and took turns going to Walgreens for food and bathroom breaks. When the doors opened, I was pushed to the ground and lost one shoe and got my dress torn, but my friends had saved me a seat right in the front. We all got to hold his hand. One more thing: My friend, Fran Jackson is the girl in the picture taken by a Miami Herald photographer that later appeared full page in Life Magazine holding Elvis’ ankle and screaming.